RER and Métro trains with bus or ORLYVAL combinations are good public transportation alternatives to Le Bus Direct (previously Les Cars Air France) for travel to Aéroport Paris-Orly ORY. Getting to Aéroport d’Orly (ORY) from downtown Paris is possible by public transportation using buses or the ORLYVAL to RER and Metro train stations. However, public transportation from Orly to Paris is more confusing than it needs be making many travelers opting for the simpler Le Bus Direct limousine coaches (previously known as Les Cars Air France) or private airport shuttles. Airport shuttles and vans can be worth the splurge for small groups, especially as it offers services directly to hotels and specific addresses in Paris and the Ile de France region. Airport shuttles should be reserved in advance – do compare prices as fares vary widely. My Driver gives online quotations for private airport transfers without first requiring personal details or flight numbers. Public transportation to Paris-Orly Airport (ORY) is far more complicated than it needs be with no rail service directly connecting Orly Airport to the French or indeed Parisian rail network. However, it is possible to use the ORLYVAL train or buses from Orly Airport to some RER and Metro stations. Trains from these stations run very frequently (generally every 15 to 30 minutes) from around 5 am to 11 pm – it is only necessary to check schedules in advance for very early morning or late-night travel. Transportation passes covering zones 1 to 5 are generally accepted but not on the ORLYVAL (€9.30) or Le Bus Direct. The cheapest way to travel to Orly Airport from downtown Paris is to use RER line C trains with final destination Massy-Palaiseau to the station Pont de Rungis / Aéroport d’Orly. (Do not use Orly-Ville station, which is one stop before Pont de Rungis when traveling from downtown Paris on RER ligne C!) From Pont de Rungis, the “Go C Paris “(previously “Paris par le Train”) shuttle bus service runs directly to Orly Airport. From Pont de Rungis to the airport takes around 10 minutes on Go C Paris / Paris par le Train buses. The bus stops at both Terminal Orly Ouest (exit C, stop 7) and Terminal Orly Sud (exit C, stop 5). RER line C trains stop amongst others at Gare d’Austerlitz, Saint-Denis-Notre-Dame (transfers possible to line B), Invalides, and Champ de Mars-Tour Eiffel. Traveling time from Saint-Michel-Notre-Dame to Pont de Rungis is around 30 minutes. At only €6.35 using the Go C Paris buses to Pont de Rungisthis and then RER Line C trains is the cheapest way to travel from Orly Airport to downtown Paris. Combination tickets are sold at RER and metro station vending machines. The bus accepts a T+ ticket or €2 from the driver for the bus ride only. RER Line B can also be used when traveling to Orly Airport. RER B follows a route that is convenient from many parts of tourist Paris and also offers a service all the way to Paris-Charles de Gaulle Airport (CDG). When traveling from Orly to downtown Paris, use the ORLYVAL metro train from either terminal to RER Line B station Antony. The traveling time on the ORLYVAL to Antony is less than 10 minutes. From Antony to downtown Paris, use RER trains B5 or B3 heading towards Mitry-Claye or Aéroport Charles de Gaulle. When heading to Orly from downtown Paris, use only RER trains B4 heading to Saint Remy les Chevreuses. Major stations on the RER line B include Saint-Michel-Notre-Dame (transfers to RER line C), Châtelet-Les Halles (transfers to RER lines A & D), Gare du Nord (transfers to RER line D, TGV, & Eurostar), and Charles de Gaulle Airport. Traveling time from Antony on RER Ligne B is around 25 minutes to Saint-Michel-Notre-Dame and an hour to Charles de Gaulle Airport (CDG). Traveling from Orly Airport to central Paris on the ORLYVAL and RER Line B is €13.25. The ORLYVAL charges €9,30 (transportation passes not valid) to travel from Orly to Antony but the ORLYVAL is free between the two airport terminals. Book Paris Tours and Activities at GetYourGuide. Using the RER train is usually faster than the Metro making the RER trains more attractive for most travelers heading from Orly to central Paris. Buses are available from Orly Airport to metro stations including Denfert-Rochereau, Porte de Choisy, Savigny-sur-Orge, Rungis-Marché International, and Villejuif–Louis Aragon. Of these, only Denfert-Rochereau station is of real interest to most travelers. The Orlybus provides a regular service between Orly Airport and Métro station Denfert-Rochereau (lines M4 and M6). Traveling time on the Orlybus is 20 to 30 minutes with the bus stopping at both terminals at Orly Airport. The one-way fare is €8.70. 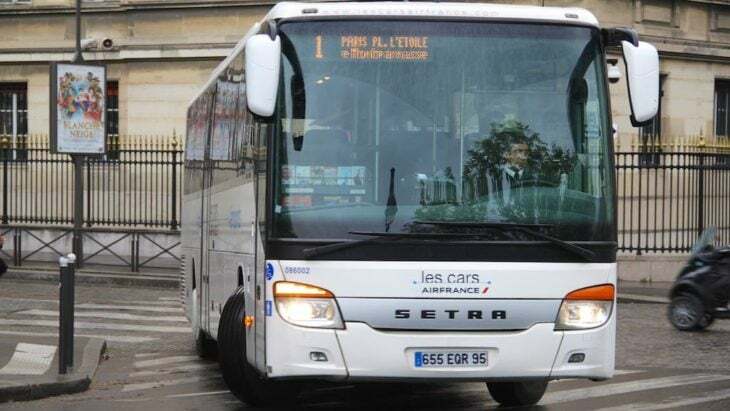 Le Bus Direct (previously Les Cars Air France) is a comfortable limousine coach options from Orly to Paris. These buses have seating for all, are air conditioned and has special space for luggage. Buses now also have USB ports and free wifi. Traveling time is around 60 minutes to Etoile or 30 minutes to Gare Montparnasse. Le Bus Direct coaches do no longer stop at Invalides or Porte d’Orléans. Le Bus Direct buses depart two to three times per hour on the Orly route from around 6 am to 11 pm. One-way fares on Le Bus Direct Line 1 are €12 (€20 return) and for children 4 to 11 €7 (€14). Groups of four or more pay €9 for tickets bought online only. Les Bus Direct line 3 connects Orly with Charles de Gaulle Airport. See Le Bus Direct for more details details. Traveling from Orly Airport to downtown Paris has always been more expensive and complicated than necessary. RER and Metro trains do not have real space for travelers on intercontinental flights and stations can be busy with long walking distances. Not surprisingly, many travelers still prefer to use the comfortable Le Bus Direct (former Les Cars Air France) limousine coaches, which provide direct transfers to downtown Paris and to Paris-Charles de Gaulle Airport. Small groups may find airport shuttles services and vans worth the splurge but do compare fares. Taxis are by the meter and around €40-50 to central Paris and at least €80 to Paris-Charles de Gaulle. Taxi2Airport gives online quotations for private airport transfers without first requiring personal details or flight numbers. It is finally possible to buy skip-the-line specific time-slot admission tickets for the Louvre Museum in Paris. These are currently available only for afternoon admissions and are well worth the slight surcharge.